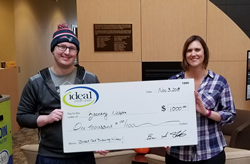 Ideal Credit Union’s popular monthly $1,000 “Use & Win” Debit Card Giveaway is back for another year of giving in 2019. Since the program’s inception in January of 2017, Ideal CU has given away $24,000 to 24 lucky members chosen at random in the “Use & Win” Debit Card promotion. Ideal CU member Zach Nelson was 2 years old when his Mom opened his account. Zach and his girlfriend just had a baby daughter so he planned to use the $1,000 to help while she's on maternity leave. Ideal Credit Union’s popular monthly $1,000 “Use & Win” Debit Card Giveaway is back for another year of giving in 2019. Since the program’s inception in January of 2017, Ideal CU has given away $24,000 to 24 lucky members chosen at random in the “Use & Win” Debit Card promotion. Previous winners have used the funds to help pay for everything from adopting a baby to car repairs, home improvements, bills, vacations, maternity leave, tuition, study abroad programs and much more!